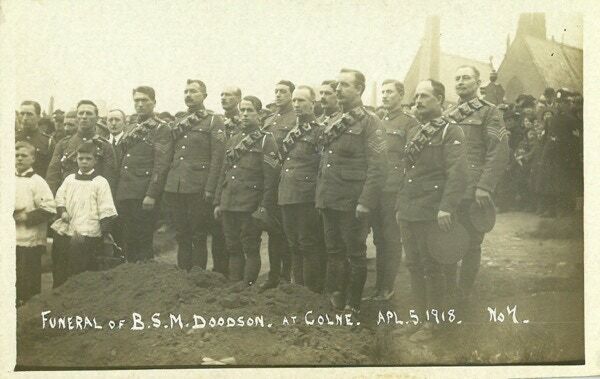 ﻿To ﻿commemorate ﻿the ﻿100th ﻿anniversary ﻿of ﻿the ﻿start ﻿of ﻿the ﻿Great ﻿War, ﻿and ﻿to ﻿honour ﻿the ﻿memory ﻿of ﻿Doodsons ﻿who ﻿suffered ﻿in ﻿the ﻿cause ﻿of ﻿freedom, ﻿I ﻿decided ﻿to ﻿try ﻿to ﻿identify ﻿all ﻿the ﻿Doodsons ﻿who ﻿joined ﻿the ﻿armed ﻿forces ﻿and, ﻿as ﻿far ﻿as ﻿the ﻿available ﻿records ﻿allow, ﻿document ﻿what ﻿they ﻿experienced ﻿during ﻿their ﻿service. ﻿It ﻿has ﻿proved ﻿rather ﻿more ﻿difficult ﻿than ﻿I ﻿expected, ﻿but ﻿has ﻿given ﻿some ﻿interesting ﻿insights ﻿into ﻿the ﻿period. ﻿Hopefully ﻿readers ﻿will ﻿find ﻿it ﻿useful ﻿and ﻿a ﻿way ﻿to ﻿make ﻿the ﻿history ﻿of ﻿their ﻿families ﻿a ﻿little ﻿more ﻿real. ﻿• ﻿Army ﻿service ﻿records ﻿- ﻿these ﻿are ﻿from ﻿microfilm ﻿of ﻿all ﻿the ﻿original ﻿documents ﻿relating ﻿to ﻿individual ﻿soldiers&apos; ﻿time ﻿in ﻿the ﻿army, ﻿including ﻿the ﻿enlistment ﻿forms, ﻿records ﻿of ﻿deployment ﻿and ﻿transfers ﻿between ﻿regiments, ﻿medical ﻿checks ﻿and ﻿eventual ﻿discharge. 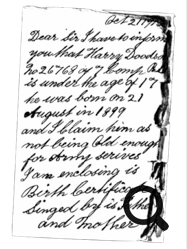 ﻿From ﻿these ﻿you ﻿can ﻿often ﻿glean ﻿their ﻿birth ﻿date, ﻿where ﻿the ﻿soldier ﻿lived, ﻿who ﻿their ﻿next ﻿of ﻿kin ﻿were, ﻿their ﻿occupation, ﻿where ﻿they ﻿were ﻿sent, ﻿what ﻿their ﻿state ﻿of ﻿health ﻿was, ﻿whether ﻿they ﻿were ﻿well-behaved ﻿while ﻿in ﻿service ﻿and ﻿whether ﻿they ﻿were ﻿injured. ﻿Sadly ﻿many ﻿of ﻿the ﻿records ﻿from ﻿the ﻿Great ﻿War ﻿were ﻿destroyed ﻿in ﻿a ﻿fire ﻿in ﻿1940 ﻿- ﻿occasionally ﻿one ﻿comes ﻿across ﻿film ﻿of ﻿records ﻿burned ﻿at ﻿the ﻿edges, ﻿and ﻿many ﻿soldiers&apos; ﻿records ﻿were ﻿lost ﻿completely. ﻿Similar ﻿records ﻿are ﻿not ﻿available ﻿for ﻿the ﻿Second ﻿World ﻿War. ﻿Some ﻿of ﻿these ﻿records ﻿are ﻿categorised ﻿as ﻿pension ﻿records ﻿(used ﻿to ﻿work ﻿out ﻿how ﻿many ﻿days ﻿men ﻿served, ﻿to ﻿be ﻿used ﻿in ﻿calculating ﻿their ﻿war ﻿pensions). ﻿• ﻿Medal ﻿records ﻿- ﻿various ﻿lists ﻿and ﻿record ﻿cards ﻿were ﻿made ﻿after ﻿the ﻿Great ﻿War ﻿that ﻿give ﻿very ﻿brief ﻿details ﻿of ﻿service ﻿men ﻿and ﻿what ﻿medals ﻿they ﻿won. ﻿There&apos;s ﻿usually ﻿very ﻿little ﻿information ﻿on ﻿these ﻿- ﻿often ﻿just ﻿surname, ﻿first ﻿name, ﻿the ﻿regimental ﻿number ﻿and ﻿their ﻿regiment ﻿name. ﻿Usually ﻿very ﻿little ﻿more. ﻿Getting ﻿much ﻿of ﻿value ﻿from ﻿these ﻿can ﻿be ﻿hard, ﻿especially ﻿if ﻿you ﻿don&apos;t ﻿have ﻿the ﻿service ﻿records ﻿and ﻿the ﻿solider ﻿has ﻿a ﻿common ﻿name. ﻿Of ﻿course, ﻿most ﻿got ﻿the ﻿Victory ﻿medal, ﻿the ﻿British ﻿War ﻿Medal ﻿and ﻿the ﻿Star. ﻿See ﻿the ﻿explanation ﻿of ﻿the ﻿medals ﻿on ﻿the ﻿National ﻿Archive ﻿web ﻿site. ﻿• ﻿Index ﻿to ﻿war ﻿deaths ﻿- ﻿a ﻿list ﻿of ﻿men ﻿who ﻿died ﻿in ﻿the ﻿army ﻿during ﻿the ﻿Great ﻿War. ﻿It ﻿doesn&apos;t ﻿seem ﻿to ﻿be ﻿complete, ﻿and ﻿gives ﻿very ﻿little ﻿information ﻿- ﻿just ﻿name, ﻿rank, ﻿regiment, ﻿regimental ﻿number ﻿and ﻿year ﻿of ﻿death. 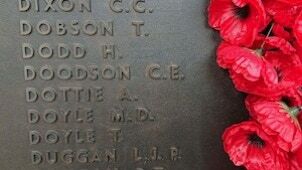 ﻿Some ﻿names ﻿identified ﻿on ﻿war ﻿graves ﻿don&apos;t ﻿appear ﻿in ﻿this ﻿list ﻿for ﻿some ﻿reason. ﻿• ﻿Commonwealth ﻿War ﻿graves ﻿- ﻿the ﻿names ﻿on ﻿official ﻿war ﻿graves ﻿from ﻿around ﻿the ﻿Commonwealth ﻿have ﻿been ﻿recorded ﻿and ﻿put ﻿on ﻿line. ﻿In ﻿some ﻿cases ﻿there ﻿are ﻿photos ﻿of ﻿the ﻿actual ﻿graves ﻿of ﻿the ﻿soldiers ﻿whereas ﻿in ﻿other ﻿cases ﻿just ﻿a ﻿photo ﻿of ﻿the ﻿site ﻿or ﻿memorial. ﻿Some ﻿of ﻿these ﻿have ﻿useful ﻿detail ﻿including ﻿next ﻿of ﻿kin. ﻿These ﻿include ﻿graves ﻿of ﻿men ﻿who ﻿died ﻿in ﻿the ﻿Second ﻿World ﻿War. ﻿• ﻿Other ﻿sources ﻿- ﻿the ﻿big ﻿genealogical ﻿sites ﻿include ﻿some ﻿or ﻿all ﻿the ﻿above, ﻿and ﻿include ﻿various ﻿other ﻿records ﻿such ﻿as ﻿"National ﻿Roll ﻿of ﻿the ﻿Great ﻿War" ﻿which ﻿gives, ﻿for ﻿a ﻿few ﻿of ﻿the ﻿many ﻿(don&apos;t ﻿know ﻿what ﻿criteria ﻿were ﻿used ﻿for ﻿inclusion ﻿of ﻿specific ﻿men) ﻿details ﻿of ﻿when ﻿they ﻿enlisted, ﻿where ﻿they ﻿were ﻿deployed ﻿and ﻿when ﻿they ﻿were ﻿discharged. ﻿Just ﻿four ﻿Doodsons ﻿are ﻿listed. 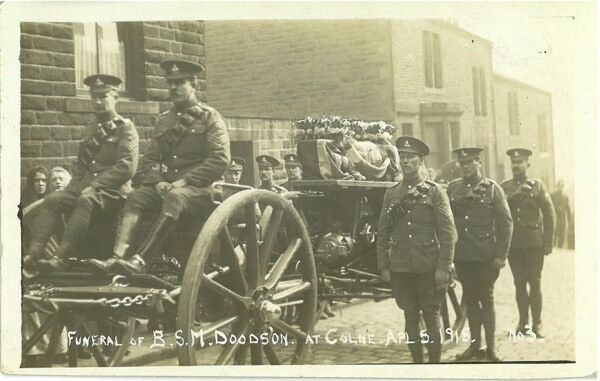 ﻿Other ﻿records ﻿include ﻿lists ﻿of ﻿men ﻿who ﻿served ﻿in ﻿the ﻿Royal ﻿Navy ﻿and ﻿medal ﻿rolls ﻿for ﻿them. ﻿Sadly ﻿most ﻿of ﻿these ﻿records ﻿give ﻿very ﻿little ﻿clue ﻿as ﻿to ﻿the ﻿actual ﻿wartime ﻿experience ﻿of ﻿these ﻿men. 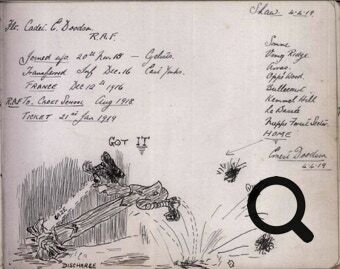 ﻿In ﻿some ﻿cases ﻿one ﻿can ﻿work ﻿out ﻿whereabouts ﻿the ﻿specific ﻿battalion ﻿the ﻿soldier ﻿was ﻿a ﻿member ﻿of ﻿was ﻿during ﻿key ﻿battles, ﻿but ﻿you ﻿would ﻿need ﻿to ﻿find ﻿the ﻿diaries ﻿kept ﻿by ﻿the ﻿officers ﻿to ﻿get ﻿more ﻿insight. ﻿Suffice ﻿it ﻿to ﻿say ﻿that ﻿many ﻿of ﻿the ﻿Doodsons ﻿I&apos;ve ﻿identified ﻿must ﻿have ﻿had ﻿horrible ﻿experiences. ﻿I ﻿recommend ﻿watching ﻿as ﻿many ﻿of ﻿the ﻿BBC&apos;s ﻿excellent ﻿programmes ﻿about ﻿the ﻿Great ﻿War ﻿as ﻿you ﻿can ﻿(and ﻿read ﻿their ﻿web ﻿site ﻿at ﻿http://www.bbc.co.uk/ww1), ﻿visiting ﻿the ﻿Imperial ﻿War ﻿Museum ﻿(or ﻿reading ﻿the ﻿material ﻿on ﻿their ﻿web ﻿site), ﻿and ﻿reading ﻿one ﻿of ﻿the ﻿many ﻿books ﻿about ﻿the ﻿Great ﻿War, ﻿such ﻿as ﻿The ﻿Great ﻿War ﻿1914-18 ﻿by ﻿Peter ﻿Hart ﻿or ﻿The ﻿First ﻿World ﻿War ﻿by ﻿Hew ﻿Strachan. ﻿The ﻿true ﻿horrors ﻿will ﻿still ﻿seem ﻿very ﻿remote ﻿to ﻿most ﻿of ﻿us ﻿but ﻿we ﻿must ﻿not ﻿forget ﻿the ﻿madnesses ﻿and ﻿sacrifices. ﻿I&apos;ve ﻿compiled ﻿a ﻿list ﻿of ﻿all ﻿the ﻿Doodson ﻿men ﻿that ﻿I ﻿could ﻿find ﻿records ﻿of, ﻿and ﻿put ﻿it ﻿into ﻿a ﻿big ﻿table ﻿to ﻿capture ﻿as ﻿much ﻿of ﻿the ﻿information ﻿as ﻿I ﻿can. ﻿Where ﻿possible ﻿I&apos;ve ﻿worked ﻿out ﻿which ﻿of ﻿the ﻿family ﻿trees ﻿in ﻿this ﻿web ﻿site ﻿the ﻿men ﻿are ﻿on. ﻿So, ﻿if ﻿you&apos;re ﻿trying ﻿to ﻿find ﻿one ﻿of ﻿your ﻿ancestors, ﻿first ﻿find ﻿which ﻿family ﻿tree ﻿they&apos;re ﻿on ﻿and ﻿then ﻿search ﻿the ﻿spreadsheet ﻿for ﻿that ﻿tree ﻿name. ﻿Unfortunately ﻿there ﻿were ﻿a ﻿set ﻿of ﻿men ﻿that ﻿I ﻿couldn&apos;t ﻿trace ﻿to ﻿family ﻿trees ﻿because ﻿there ﻿just ﻿wasn&apos;t ﻿enough ﻿information ﻿to ﻿tie ﻿them ﻿back. ﻿Most ﻿of ﻿these ﻿were ﻿on ﻿medal ﻿records ﻿but ﻿no ﻿Service ﻿Record ﻿was ﻿available, ﻿so ﻿all ﻿I ﻿had ﻿was ﻿their ﻿name, ﻿regiment ﻿and ﻿regimental ﻿number. ﻿If ﻿I ﻿find ﻿a ﻿way ﻿of ﻿tracing ﻿more ﻿about ﻿these ﻿men ﻿I&apos;ll ﻿update ﻿the ﻿list ﻿in ﻿due ﻿course. ﻿But ﻿for ﻿now ﻿these ﻿unsung ﻿heroes ﻿will ﻿have ﻿to ﻿remain ﻿just ﻿names ﻿on ﻿a ﻿list. ﻿Note ﻿that ﻿there ﻿are ﻿a ﻿few ﻿men ﻿on ﻿the ﻿list ﻿who ﻿served ﻿in ﻿conflicts ﻿other ﻿than ﻿the ﻿Great ﻿War ﻿- ﻿one ﻿or ﻿two ﻿in ﻿earlier ﻿theatres ﻿such ﻿as ﻿the ﻿Crimea ﻿or ﻿China, ﻿one ﻿or ﻿two ﻿in ﻿the ﻿Second ﻿World ﻿War. ﻿I&apos;ve ﻿included ﻿them ﻿here ﻿as ﻿there ﻿are ﻿very ﻿few ﻿such ﻿records ﻿so ﻿they&apos;re ﻿unlikely ﻿to ﻿feature ﻿on ﻿other ﻿lists ﻿on ﻿this ﻿site. ﻿Thanks ﻿to ﻿Helen ﻿Barrett ﻿for ﻿the ﻿following ﻿information. 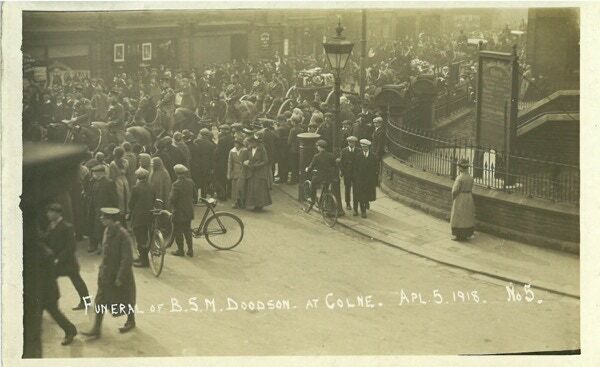 ﻿Helen ﻿is ﻿a ﻿descendent ﻿of ﻿Gertrude ﻿Doodson ﻿(b.1882) ﻿on ﻿the ﻿Pilkington ﻿family ﻿tree. 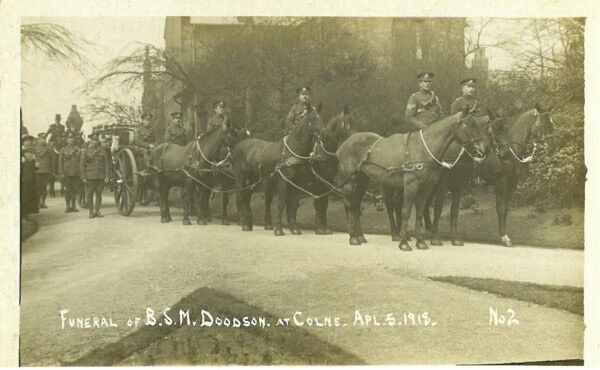 ﻿Albert ﻿Doodson ﻿was ﻿Gertrude&apos;s ﻿brother. 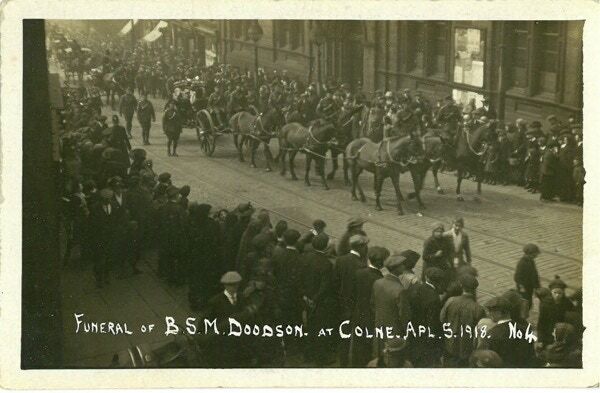 ﻿A ﻿collection ﻿of ﻿postcards ﻿were ﻿produced ﻿to ﻿commemorate ﻿the ﻿event, ﻿which ﻿was ﻿watched ﻿by ﻿many ﻿locals ﻿as ﻿seen ﻿in ﻿the ﻿photos ﻿below ﻿- ﻿click ﻿to ﻿see ﻿bigger ﻿versions ﻿of ﻿the ﻿photos. ﻿Harry ﻿first ﻿enlisted ﻿in ﻿his ﻿home ﻿town ﻿of ﻿Glossop ﻿on ﻿18th ﻿March ﻿1915, ﻿and ﻿went ﻿through ﻿basic ﻿training ﻿with ﻿the ﻿Cheshire ﻿Regiment, ﻿but ﻿when ﻿it ﻿was ﻿discovered ﻿that ﻿he ﻿was ﻿under ﻿age ﻿he ﻿was ﻿discharged ﻿at ﻿Oswestry ﻿on ﻿27th ﻿August ﻿1915. ﻿He ﻿was ﻿born ﻿21st ﻿August ﻿1899, ﻿so ﻿he ﻿was ﻿only ﻿16 ﻿years ﻿old ﻿when ﻿he ﻿first ﻿enlisted! ﻿Not ﻿put ﻿off ﻿by ﻿this ﻿experience ﻿Harry ﻿enlisted ﻿again ﻿(again ﻿in ﻿Glossop), ﻿on ﻿11th ﻿October ﻿the ﻿same ﻿year, ﻿joining ﻿the ﻿Royal ﻿Scots ﻿Regiment ﻿and ﻿went ﻿up ﻿to ﻿Scotland ﻿for ﻿training. 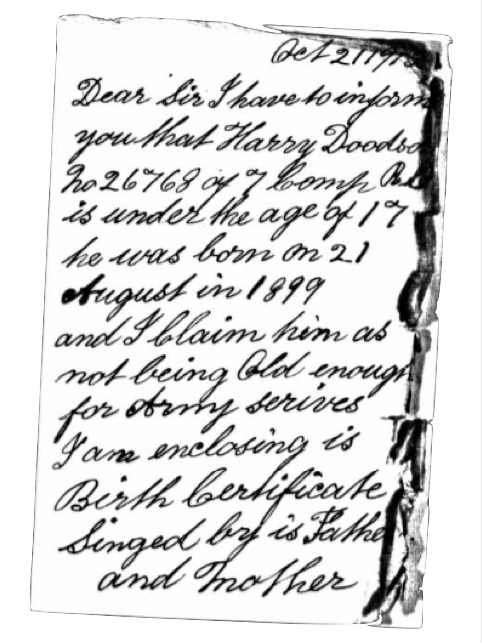 ﻿This ﻿time ﻿his ﻿parents, ﻿Sam ﻿and ﻿Sarah ﻿Doodson, ﻿wrote ﻿to ﻿the ﻿commanding ﻿officer ﻿to ﻿tell ﻿him ﻿that ﻿Harry ﻿was ﻿still ﻿younger ﻿than ﻿17 ﻿years ﻿old, ﻿and ﻿they ﻿even ﻿sent ﻿his ﻿birth ﻿certificate ﻿to ﻿prove ﻿it. ﻿The ﻿letter ﻿said ﻿"I ﻿claim ﻿him ﻿as ﻿not ﻿being ﻿old ﻿enough ﻿for ﻿Army ﻿services". ﻿Harry ﻿was ﻿thus ﻿discharged ﻿again, ﻿this ﻿time ﻿in ﻿Glencorse ﻿in ﻿Scotland. 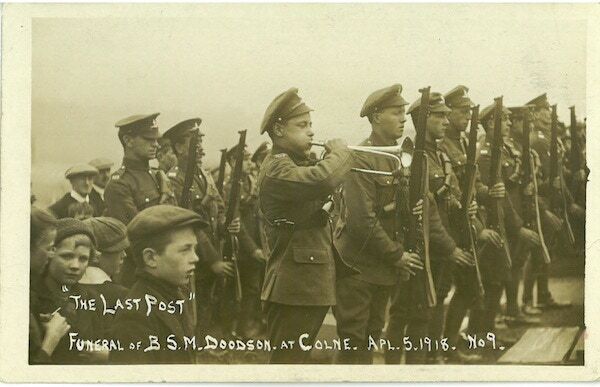 ﻿This ﻿did ﻿not ﻿put ﻿Harry ﻿off, ﻿as ﻿on ﻿the ﻿very ﻿day ﻿of ﻿his ﻿18th ﻿birthday, ﻿on ﻿21st ﻿August ﻿1917 ﻿he ﻿signed ﻿up ﻿again, ﻿this ﻿time ﻿joining ﻿the ﻿Border ﻿Regiment. 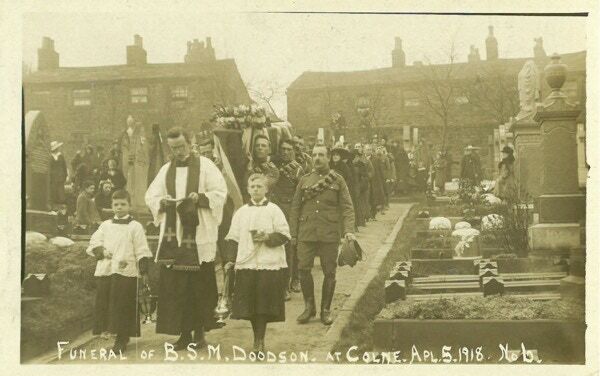 ﻿He ﻿served ﻿with ﻿them ﻿until ﻿after ﻿the ﻿end ﻿of ﻿the ﻿war, ﻿being ﻿discharged ﻿finally ﻿on ﻿6th ﻿December ﻿1919. ﻿Frederick ﻿was ﻿born ﻿in ﻿1895 ﻿and ﻿was ﻿among ﻿the ﻿first ﻿Australians ﻿to ﻿sign ﻿up ﻿for ﻿service, ﻿leaving ﻿New ﻿South ﻿Wales ﻿in ﻿October ﻿1914. ﻿He ﻿was ﻿known ﻿as ﻿"Curley" ﻿and ﻿was ﻿well ﻿known ﻿in ﻿Pyrmont, ﻿where ﻿he ﻿worked, ﻿and ﻿Lidcombe ﻿where ﻿his ﻿parents ﻿lived ﻿(both ﻿are ﻿suburbs ﻿of ﻿Sydney) ﻿as ﻿a ﻿swimmer ﻿and ﻿boxer. ﻿After ﻿training ﻿exercises ﻿in ﻿Egypt ﻿he ﻿was ﻿part ﻿of ﻿the ﻿Allied ﻿forces ﻿that ﻿went ﻿to ﻿the ﻿Dardanelles ﻿(a ﻿narrow ﻿straight ﻿of ﻿water ﻿between ﻿the ﻿Black ﻿Sea ﻿and ﻿the ﻿Sea ﻿of ﻿Marmara, ﻿in ﻿Turkey). ﻿The ﻿Gallipoli ﻿peninsula ﻿is ﻿on ﻿the ﻿European ﻿side ﻿of ﻿the ﻿straight, ﻿and ﻿it ﻿was ﻿in ﻿the ﻿fighting ﻿at ﻿Gallipoli ﻿that ﻿Frederick ﻿was ﻿injured, ﻿later ﻿to ﻿die ﻿on ﻿a ﻿hospital ﻿ship ﻿(Gascon) ﻿some ﻿time ﻿between ﻿25th ﻿and ﻿29th ﻿April ﻿1915. ﻿He ﻿was ﻿one ﻿of ﻿some ﻿8,700 ﻿Australians ﻿to ﻿have ﻿lost ﻿their ﻿lives ﻿in ﻿the ﻿Gallipoli ﻿campaign. ﻿Including ﻿both ﻿Allies ﻿and ﻿Turkish ﻿forces, ﻿more ﻿than ﻿100,000 ﻿troops ﻿died ﻿in ﻿the ﻿long, ﻿bloody ﻿and ﻿ultimately ﻿fruitless10 ﻿months ﻿of ﻿fighting ﻿up ﻿to ﻿early ﻿1916 ﻿when ﻿the ﻿Allies ﻿withdrew, ﻿unsuccessful. ﻿You ﻿might ﻿have ﻿spotted ﻿that ﻿Frederick&apos;s ﻿death ﻿was ﻿immediately ﻿after ﻿the ﻿Allied ﻿landings ﻿on ﻿25th ﻿April ﻿1915, ﻿at ﻿a ﻿cove ﻿dubbed ﻿"ANZAC ﻿cove", ﻿because ﻿this ﻿was ﻿where ﻿Australian ﻿and ﻿New ﻿Zealand ﻿troops ﻿attempted ﻿their ﻿initial ﻿thrust. 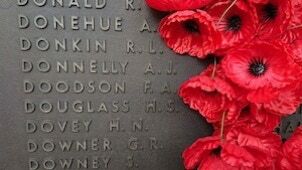 ﻿And ﻿Australians ﻿and ﻿New ﻿Zealanders ﻿will, ﻿of ﻿course, ﻿have ﻿spotted ﻿that ﻿this ﻿date, ﻿25th ﻿April, ﻿is ﻿commemorated ﻿as ﻿ANZAC ﻿day. ﻿There&apos;s ﻿a ﻿really ﻿interesting ﻿and ﻿harrowing ﻿description ﻿of ﻿the ﻿landings ﻿from ﻿someone ﻿on ﻿the ﻿hospital ﻿ship ﻿at ﻿http://www.unioncastlestaffregister.co.uk/SHIP_GASCON_(2)_01.html ﻿"[...] ﻿by ﻿dusk ﻿we ﻿were ﻿filled ﻿to ﻿capacity ﻿and ﻿over, ﻿all ﻿wards ﻿and ﻿available ﻿deck ﻿space ﻿being ﻿crammed ﻿with ﻿wounded." ﻿Frederick&apos;s ﻿death ﻿received ﻿coverage ﻿in ﻿a ﻿number ﻿of ﻿Australian ﻿newspapers, ﻿including ﻿extracts ﻿from ﻿the ﻿last ﻿letter ﻿he ﻿wrote ﻿home ﻿to ﻿his ﻿parents ﻿from ﻿the ﻿training ﻿camp ﻿in ﻿Egypt. ﻿In ﻿May ﻿1915 ﻿two ﻿parts ﻿of ﻿a ﻿street ﻿in ﻿Lidcombe ﻿were ﻿renamed ﻿in ﻿memory ﻿of ﻿Frederick ﻿- ﻿the ﻿newspaper ﻿article ﻿in ﻿May ﻿1915 ﻿explained ﻿that ﻿someone ﻿had ﻿pulled ﻿down ﻿the ﻿street ﻿sign ﻿for ﻿Hanover ﻿Street, ﻿and ﻿it ﻿was ﻿presumed ﻿that ﻿this ﻿was ﻿done ﻿by ﻿someone ﻿with ﻿anti-German ﻿views. ﻿One ﻿end ﻿of ﻿the ﻿street ﻿was ﻿renamed ﻿"Frederick ﻿Street", ﻿the ﻿other ﻿"Doodson ﻿Street". ﻿After ﻿his ﻿death ﻿his ﻿football ﻿team, ﻿Pyrmont, ﻿commemorated ﻿him ﻿by ﻿donning ﻿black ﻿armbands ﻿- ﻿see ﻿this ﻿fascinating ﻿article ﻿about ﻿it. 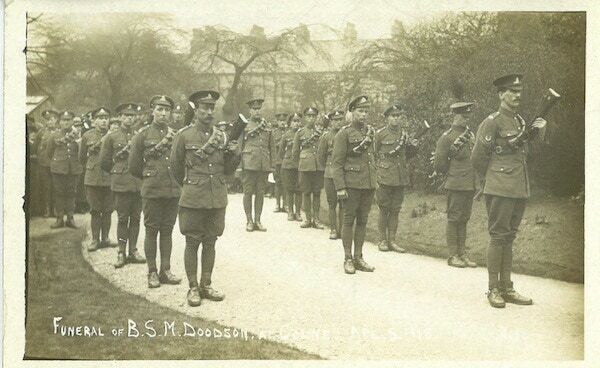 ﻿Frederick&apos;s ﻿brother ﻿Walter ﻿Victor ﻿Doodson ﻿also ﻿went ﻿to ﻿Egypt ﻿for ﻿training. ﻿Walter ﻿was ﻿injured ﻿and ﻿hospitalised ﻿in ﻿1915 ﻿in ﻿Cardiff, ﻿Wales, ﻿before ﻿returning ﻿to ﻿Australia. ﻿He ﻿died ﻿in ﻿1969. ﻿Another ﻿of ﻿Frederick&apos;s ﻿relatives, ﻿Charles ﻿(Frederick ﻿and ﻿Walter&apos;s ﻿half-brother) ﻿also ﻿joined ﻿up ﻿and ﻿served ﻿in ﻿France, ﻿in ﻿the ﻿3rd ﻿Light ﻿Trench ﻿Mortars, ﻿attacking ﻿the ﻿Hindenberg ﻿Line ﻿near ﻿Bullecourt. ﻿Sadly ﻿he ﻿died ﻿in ﻿1917 ﻿and ﻿was ﻿buried ﻿in ﻿Boulogne. 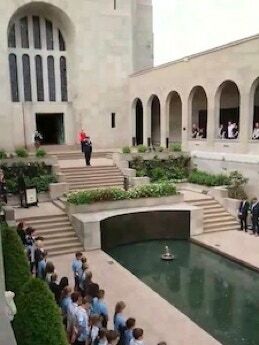 ﻿Australian ﻿servicemen ﻿are ﻿commemorated ﻿at ﻿the ﻿Australian ﻿War ﻿Memorial ﻿in ﻿Canberra. 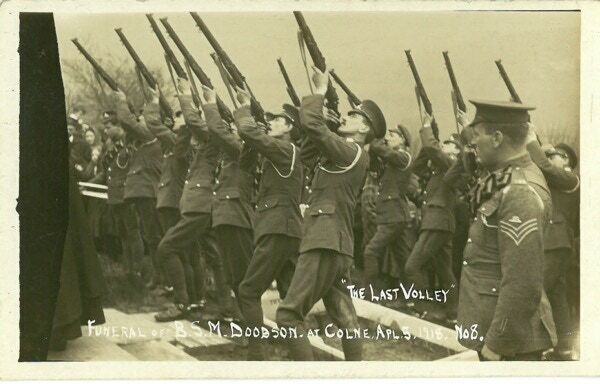 ﻿Our ﻿great ﻿friend ﻿from ﻿Australia, ﻿Lee ﻿Hoinville, ﻿recently ﻿visited ﻿and ﻿took ﻿the ﻿following ﻿pictures, ﻿showing ﻿the ﻿names ﻿of ﻿Frederick ﻿Allen ﻿Doodson ﻿and ﻿his ﻿brother ﻿Charles ﻿at ﻿the ﻿memorial, ﻿as ﻿well ﻿as ﻿a ﻿photo ﻿of ﻿the ﻿daily ﻿"last ﻿post" ﻿ceremony ﻿of ﻿remembrance. Alfred joined the Mercantile Marine Reserve, as a ship&apos;s cook. The MMR was a reserve of merchant seamen who were effectively co-opted into the Royal Navy at the start of the war. Alfred, whose death is commemorated at the Plymouth Naval Memorial, was killed when the ship he was serving on, the SS Laurentic, was struck by two mines, off the coast of Ireland on 25th January 1917. The ship sank within just an hour and of the 475 men aboard only 121 survived. Many bodies were never recovered. The Laurentic had been used as a troop transport for men from Canada, but was later converted into an armed merchant cruiser (strengthened and with added guns to transport goods and fend off attack from enemy vessels). ﻿This ﻿is ﻿the ﻿author&apos;s ﻿paternal ﻿grandfather. ﻿Grandpa ﻿was ﻿reluctant ﻿to ﻿talk ﻿about ﻿his ﻿time ﻿in ﻿the ﻿first ﻿World ﻿War, ﻿and ﻿the ﻿family ﻿knew ﻿very ﻿little ﻿concrete ﻿about ﻿what ﻿he ﻿did ﻿and ﻿where ﻿he ﻿went ﻿in ﻿Europe ﻿during ﻿the ﻿war. 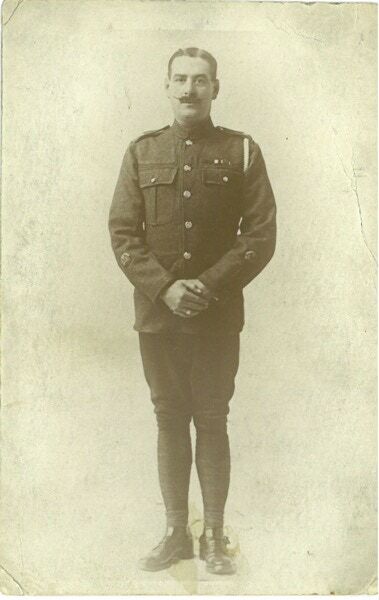 ﻿We ﻿had ﻿a ﻿vague ﻿notion ﻿that ﻿he ﻿was ﻿in ﻿some ﻿sort ﻿of ﻿communications ﻿battalion, ﻿and ﻿that ﻿initially ﻿he ﻿signed ﻿up ﻿for ﻿a ﻿bicycle ﻿regiment ﻿or ﻿something ﻿like ﻿that ﻿(see ﻿the ﻿photo ﻿of ﻿young ﻿Ernest ﻿in ﻿uniform, ﻿a ﻿rifle ﻿strapped ﻿to ﻿his ﻿bicycle ﻿on ﻿the ﻿Photos ﻿page. ﻿Fairly ﻿recently ﻿I ﻿found ﻿a ﻿very ﻿interesting ﻿Oldham ﻿Historical ﻿Research ﻿Group ﻿web ﻿site ﻿that ﻿has ﻿scans ﻿of ﻿an ﻿Memorial ﻿Autograph ﻿book ﻿at ﻿St ﻿Paul&apos;s ﻿Methodist ﻿Church ﻿in ﻿Shaw, ﻿where ﻿Ernest ﻿lived. 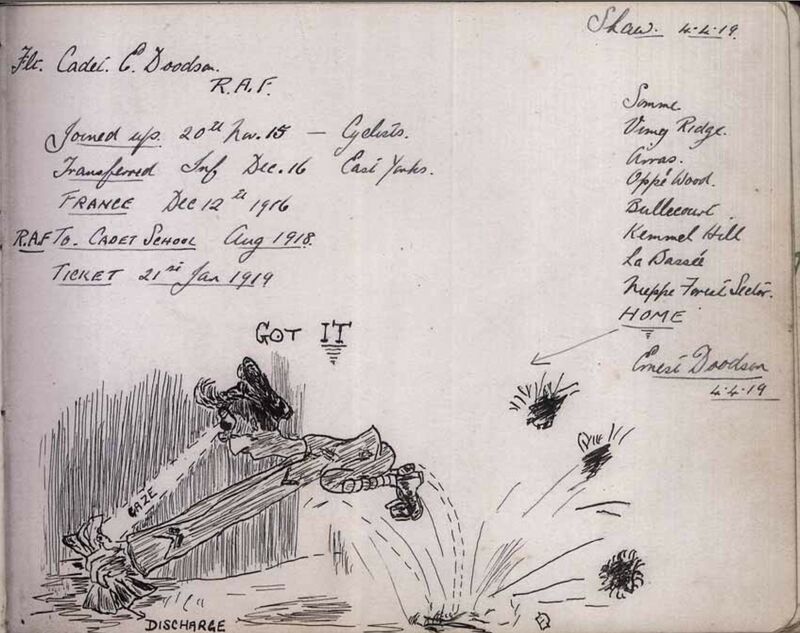 ﻿Ernest ﻿left ﻿his ﻿mark ﻿in ﻿a ﻿strange ﻿little ﻿cartoon ﻿dated ﻿4th ﻿April ﻿1919 ﻿showing ﻿how ﻿happy ﻿he ﻿was ﻿to ﻿be ﻿discharged! ﻿A ﻿few ﻿fascinating ﻿snippets ﻿here ﻿- ﻿he ﻿did ﻿join ﻿up ﻿in ﻿a ﻿Cyclist ﻿regiment, ﻿before ﻿being ﻿transferred ﻿to ﻿the ﻿East ﻿Yorkshire ﻿regiment. ﻿He ﻿lists ﻿on ﻿the ﻿right ﻿hand ﻿side ﻿the ﻿places ﻿he ﻿went ﻿- ﻿some ﻿of ﻿the ﻿most ﻿awful ﻿places ﻿in ﻿the ﻿war: ﻿the ﻿Somme, ﻿Vimy ﻿Ridge, ﻿Bullecourt, ﻿Kemmel ﻿Hill. ﻿And ﻿notice ﻿that ﻿he ﻿also ﻿latterly ﻿joined ﻿the ﻿fledgling ﻿RAF ﻿in ﻿August ﻿1918. ﻿We ﻿have ﻿no ﻿idea ﻿what ﻿he ﻿did ﻿in ﻿the ﻿RAF.